Unique names are given for the seven basic elements in each definition. Obviously, this can be quite a tedious and error prone task when the size of the circuit gets larger. The tedious and error prone steps involved in giving unique names to the seven device elements in the model of 5.1 (b) and giving unique names to the three internal nodes in the model are automatically handled by the subcircuit feature of SIMPLIS. The definition and the usage of the subcircuit feature of SIMPLIS is explained in detail in this chapter. 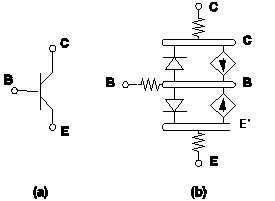 5.1 Ebers-Moll model of an NPN transistor: (a) Circuit symbol, (b) the Ebers-Moll model. Note: B', C', and E' are the internal nodes introduced for modelling purposes.